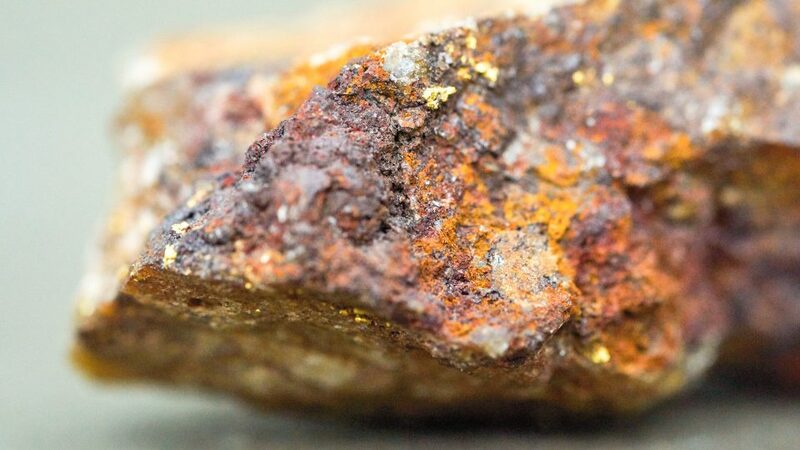 Red Rock has entered into an agreement to carry out gold and manganese exploration across three licenses in the highly prospective Birimian greenstone belt in the Ivory Coast - a country that is being touted as the next frontier for gold exploration in West Africa. 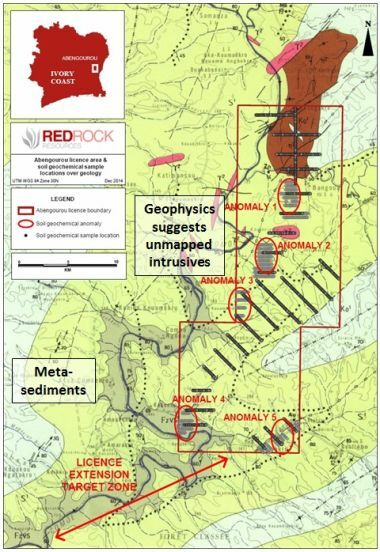 Red Rock has entered into an agreement with local companies Nemex Resources CI SARL and Barclay Resources CI SARL to explore for gold and manganese across three licenses in eastern Ivory Coast. In ground selection, the companies benefited from the insights of individuals with outstanding local geological knowledge and were able to acquire some highly prospective ground as a result. Preliminary exploration results have been promising. The Dabakala license covers 393.4km2 in north-central Ivory Coast and occupies part of the Ouango-Fetini Greenstone belt along trend from Semafo’s 6.0Moz Mana Gold Mine in Burkina Faso. The ground is considered highly prospective for both gold and manganese and the immediate vicinity has been targeted by Newmont, Randgold and Resolute Mining. 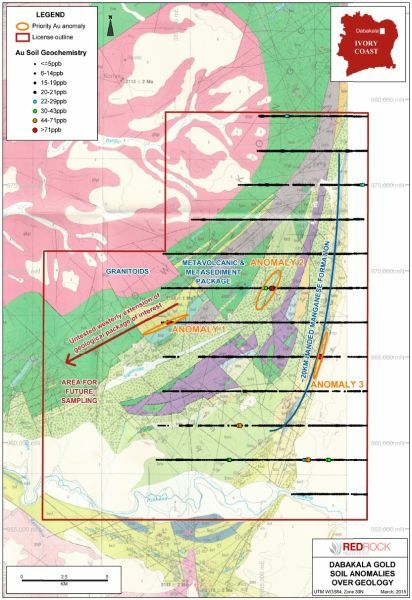 The area comprises thrusted, thick units of highly altered greenstones wrapped around granitic intrusions and the emerging depositional model is analogous to Randgold's c. 5.8Moz Tongon Gold Deposit in northern Ivory Coast. Dabakala's eastern margin contains a 17km long Banded Manganese Formation (BMF) ridge considered a target for Manganese deposits. The ridge will be a focus of future field programmes alongside follow up assessment of any Au anomalies evident from the pending soil geochemical results. The results of the preliminary regional soil geochemical sampling programme, from which 650 composite samples were generated, show nine gold anomalies up to 385 ppb Au of which three are considered the most significant at this early stage of exploration. Red Rock is particularly encouraged by the correlation between the anomalies and underlying geological and structural features, particularly since some of the anomalies overlie packages of volcanic and sedimentary rocks neighbouring a granite that have been interpreted to be significantly thrust-faulted. The Tongon Gold Deposit in northern Côte d'Ivoire was the geological analogy proposed by Nemex Resources for this area. Red Rock is planning the next stage of exploration, likely to involve infill soil sampling or shallow auger drilling along closely spaced grids over the high priority anomalies. Additional sampling is planned over significant areas extending away from the anomalies that have not yet been the subject of any sampling for logistical reasons, particularly in the western portion of the license. The Company also intends to collect a number of grab samples along a 17 kilometre-long ridge that Nemex Resources identified as a banded manganese formation (BMF). The Abengourou license covers 399.6km2 in eastern Ivory Coast and is positioned along a 35km long, NNE-trending sheared corridor containing magnetic intrusive rocks. Five soil geochemical gold anomalies have been identified leading to an application to extend the area to the southwest to capture an expected continuation of the anomalous structural trend. Future work will focus on follow-up testing of the existing soil anomalies in addition to soil geochemical sampling of the license extension, once granted. The Alepe license covers 392.6km2 in south eastern Ivory Coast and contains a NE-SW faulted Birimian meta-sedimentary sequence wrapped around a granite intrusion. The area contains more than 30km of structural target in ground considered a potential cross-border extension of Ghana's gold-rich Sefwi Greenstone Belt, host to Newmont's c. 17Moz Ahafo Gold Mine. During the preliminary soil geochemical programme, 238 samples were collected at 100m intervals along 2km spaced lines, testing approximately 20% of the total license area. All samples underwent preparation at SGS Yamoussoukro, after which they were forwarded to SGS Ouagadougou for gold and arsenic analysis. 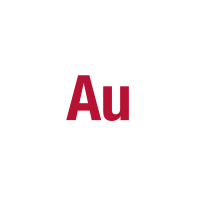 The results appear to confirm the presence of gold at Alepe, with some zones considered mildly anomalous. Red Rock intends to complete sampling of the remaining, as yet untested ~80% of the license area to build a more complete dataset before determining next steps for progressing the license. Red Rock also has interests in several licenses currently under application in central and eastern Ivory Coast. 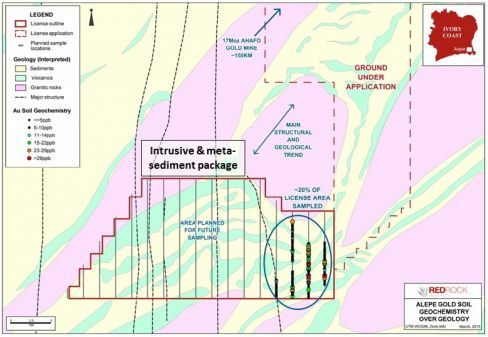 All areas applied for are underlain by Birimian greenstone units with local geological and structural features highly prospective for gold mineralisation. 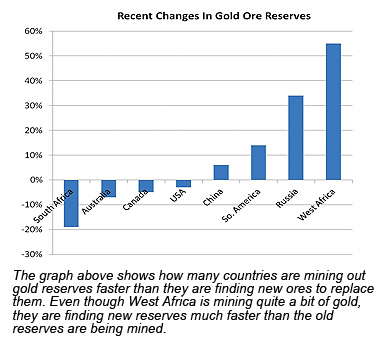 Most areas are located proximal or along trend of major gold deposits. Ivory Coast possesses some of West Africa's best infrastructure yet remains a largely underexplored country with exceptional mineral potential. As political stability has returned to the country in recent years, a new wave of explorers including successful gold producers have begun operations and, since 2010, opened mines. Mining serves as an economic engine for West Africa, supplying about nine percent of the world’s bauxite, and eight percent of its gold. The area is seeing a significant increase in railway construction in order to transport ore to ports and this has led to the opening of mines in Guinea, Liberia and Sierra Leone. Its untapped resources of high grade iron-ore are attracting significant international attention. West Africa's extensive Birimian Greenstone Belt is a fast growing region for gold exploration and production. Ivory Coast contains more than a third of the Birimian greenstone geology yet, due to the relative lack of exploration, produces less gold than neighbouring countries. Ghana is the region's greatest producer, with most production coming from the rich Ashanti Belt, home to numerous multi-million ounce world-class deposits in southwest Ghana, close by the Ivorian border.